As of September 28, 2016 "Gary Uebelhoer with Environmental Consulting Technology says nine wells were tested Monday and so far the results show no contamination." Click on Mosaic Environmental Disaster Sinkhole image to open full-size in new window. We have found at least one defense Mosaic will be using to the Mosaic Sinkhole Lawsuit when they said, "According to a study by Florida State University, 'Some of the surface and shallow aquifer waters have higher than average concentrations of radium.' " We suspect they will claim the newly-found radioactivity in your water supply was already there or was "higher than average" before the New Wales Water Loss Incident. 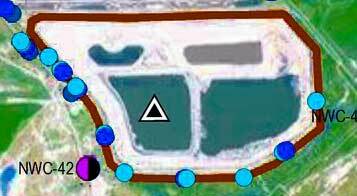 There is at least one source that reports the Floridan Aquifer flows to the West from the New Wales site. Please get a water test at no cost from the Florida Department of Environmental Protection (FDEP). You can contact them online at http://www.dep.state.fl.us/secretary/ps/default.htm. If all else fails, you can consider using the Mosaic contractor for water testing. Mosaic says "The number to call for inquiries about testing or bottled water is (813) 500-6575 "
Polk County Florida Mosaic Phosphogypsum Stack Sinkhole Claims? If the federal government cannot protect those injured in the alleged Polk County, Florida radioactive sinkhole , then who will? "Mosaic is one of the fertilizers industry’s best performers in its ability to reduce large volumes of corrosive wastewater in its phosphogypsum stack systems." This is a direct quote from an Environmental Protection Agency source. Check it our here: https://www.epa.gov/enforcement/mosaic-fertilizer-llc-settlement . If that is what the federal government found, who is going to protect those injured in the alleged Polk County, Florida radioactive sinkhole spilling into the Floridan aquifer? Mosaic was ordered to "prevent the release of hazardous, or highly-corrosive, wastewaters from fertilizer production to the phosphogypsum stack system through an innovative reconfiguration of current operations." Furthermore, Mosaic was to "significantly reduce the amount of ammonia going to the phosphogypsum stack system by reconfiguring secondary scrubbers to cease circulation of ammonia-laden corrosive wastewater back to the phosphogypsum stack system." In light of a huge sinkhole in the Mosaic property and the alleged leakage of contaminated water into the Floridan aquifer it is notable that EPA demanded, "Mosaic will implement a best management practices plan to address potential leaks and spills of phosphoric acid from phosphoric acid and granulation operations." "Mosaic has agreed to comprehensive financial assurance provisions, including a $630 million dedicated trust fund, as well as a $50 million letter of credit and a corporate guarantee by its parent company, The Mosaic Company, to ensure funds are available for its estimated cost of $1.8 billion for closure and long-term care of its phosphogypsum stack systems in Florida and Louisiana." "Mosaic has additionally agreed to provide a corporate guarantee from its parent company for $8 million in annual coverage for accidental occurances that cause property damage or bodily injury to third parties." Polk County Florida Mosaic Phosphogypsum Stack Sinkhole Claims? If the federal government cannot protect those injured in the alleged Polk County, Florida radioactive sinkhole , then who will? phosphate fertilizer manufacturing plant located in Mulberry, Florida (“New Wales Facility”). 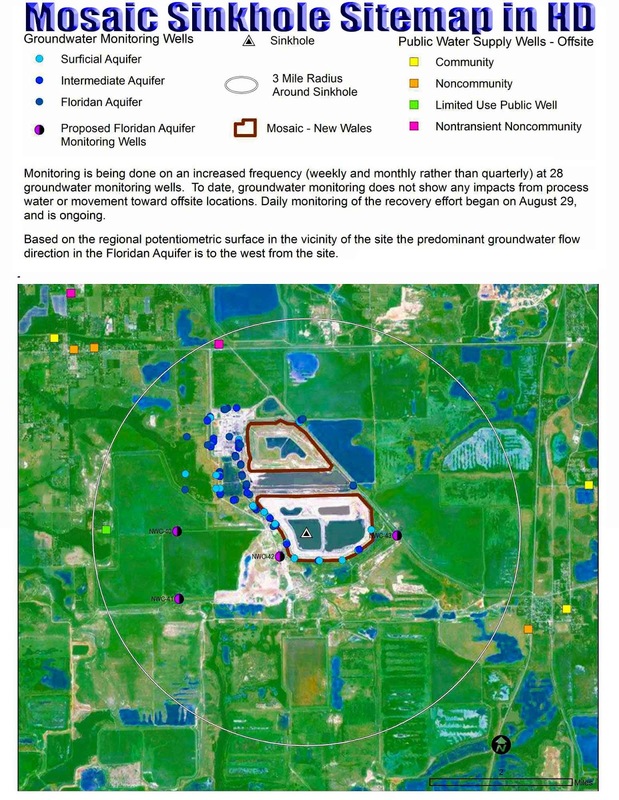 contamination in the Floridan Aquifer. human health and safety and to the environment. 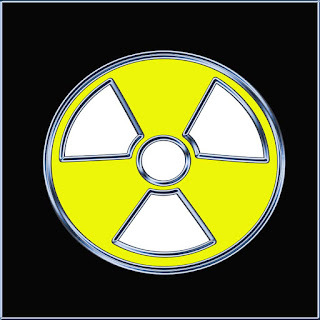 toxic radioactive wastewater produced from Defendants’ New Wales Facility. private well located on her residential property. located on the rental property. Mosaic Company’s New Wales Facility located in Mulberry, Florida. produces finished phosphate products used in crop fertilizers and animal feed. the direction and under the control of its parent, The Mosaic Company. controversy exceeds $5,000,000, exclusive of interest and costs. McCormick and Eric Weckman, reside in this District. agreement between Cargill, Inc. and IMC Global to form the new crop nutrition company. and is publicly traded on the New York Stock Exchange using the stock moniker “MOS”. New Mexico and Saskatchewan Canada. from Mosaic-owned mines in Central Florida and Saskatchewan Canada. Florida referred to herein as the “New Wales Facility”. New Wales Facility as a foreign corporation authorized to do business in the State of Florida. plant, located at 3095 County Road 640, Mulberry, Florida 33860.
source for phosphoric acid, the necessary ingredient in Mosaic’s phosphate fertilizers. and other insoluble materials from the phosphoric acid. phosphogypsum indefinitely in open storage areas called gypsum stacks, or gypstacks. allowing for increased storage capacity. gallons of the slurried radioactive phosphogypsum. – The South Gypsum Stack. Phase II provides for an increase to the height of the Phase I site from 200 to 300 feet high. escaped the South Gypsum Stack via the sinkhole. during the production of phosphoric acid. are not limited to, arsenic, lead, cadmium, chromium, zinc, antimony, iron, and copper. into the Floridan Aquifer via a sinkhole. 02286) (The parties agreed to the terms of the Consent Decree in September 2015. The Consent Decree and its Appendixes were signed and entered by the Judge on August 5, 2016.). water supply from a privately owned well. subclasses or modified in any way. information regarding property ownership and/or residential history. 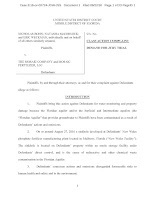 contaminated water from Defendants’ actions. exposed or at risk of being exposed to dangerous chemicals and need redress to prevent harm. counsel has interests adverse to the classes. k. Whether Defendants’ conduct warrants the imposition of punitive damages. superior to other available methods for the fair and efficient adjudication of this controversy. their claims to be prohibitively high and, therefore, would have no effective remedy at law. Further, without class litigation, class members will continue to incur damages. of the courts and the litigants, and will promote consistency and efficiency of adjudication. 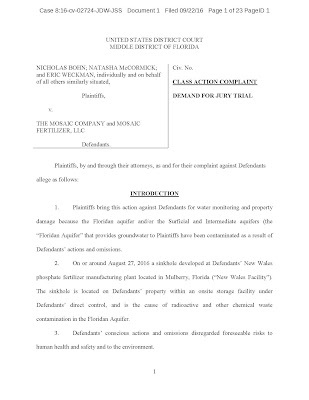 wastewater from Plaintiffs’ private well water. and property of Plaintiffs and members of the classes. the classes seek to maintain a class action with respect to particular issues under Rule 23(c)(4). through 63 as if fully restated herein. wastewater was discharged from the gypstack and entered the Floridan Aquifer. contaminants, as defined by Florida Statutes §§ 376.301(09), 376.301(10) and 376.301(12). aquifer for their private well water for drinking water and other personal and business uses. 63 as if fully restated herein. phosphogypsum wastewater stacks at its New Wales Facility – namely, the South Gypsum Stack. byproduct produced from the manufacture of phosphoric acid. supply, such as Plaintiffs and class members. the result of Defendants’ abnormally dangerous activities and was foreseeable by Defendants. paragraphs 1 through 63 as if fully stated herein. Facility was unreasonable, unwarranted and unlawful. contamination of their respective properties, as well as the damages set forth below. 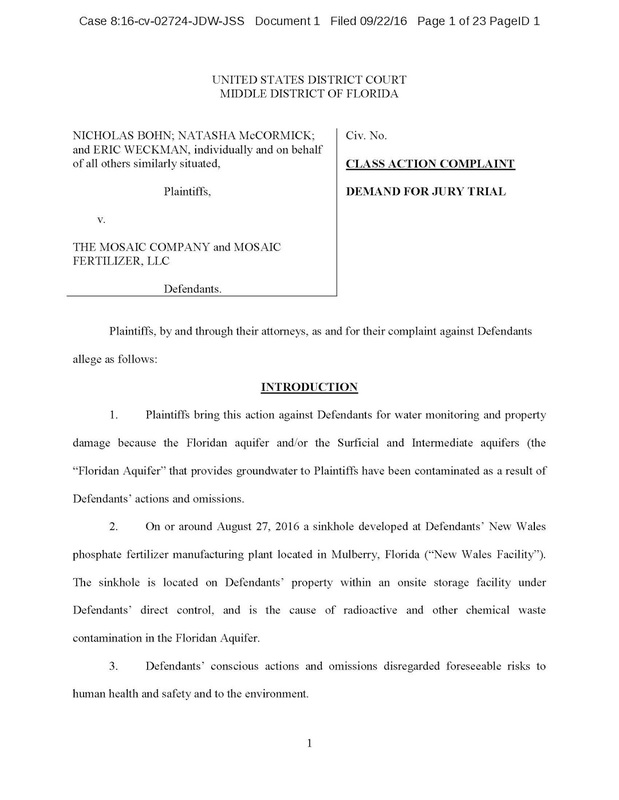 the groundwater and, thus, to threaten Plaintiffs’ and class members’ private water wells. wastewater does not enter Floridan Aquifer and contaminate groundwater. materials from the stank to enter and contaminate groundwater. dangerous and unreasonable risk of injury to the Plaintiffs. the storage of the phosphogypsum wastewater at Defendants’ New Wales Facility. effects and failed to prevent or adequately warn of these risks and injuries. storage of its phosphogypsum waste. economic loses that Plaintiffs suffered, and will continue to suffer, as described herein. by Plaintiffs for drinking water and other personal and business uses. been damages and continue to be damaged. indifference to the life, safety, or rights of the Plaintiffs and the class. damages pursuant to Fla. Stat. Ann. § 768.72.
limited to, implementation of a mandatory testing protocol requiring Defendants to immediately . . .